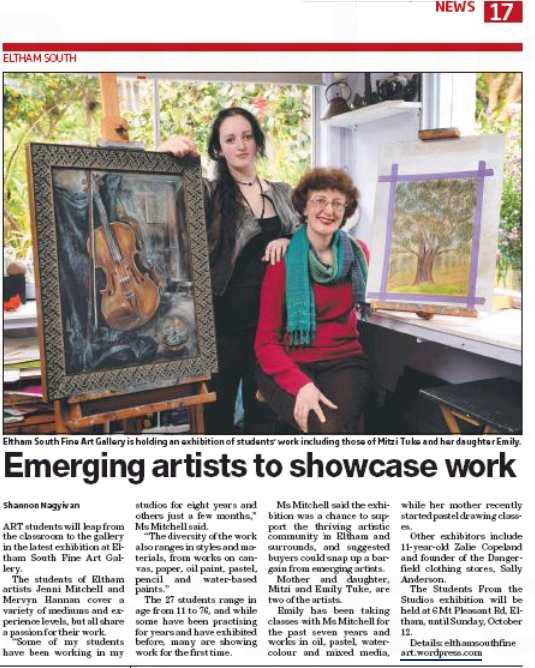 The first all day orchard garden painting workshop will be held at Eltham South Fine Art on Sunday September 16. 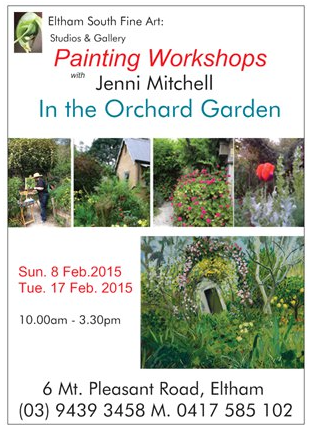 Set in the large ELTHAM orchard garden amongst the fruit and citrus trees, hen house, flower and vegetable garden Jenni Mitchell will demonstrate how to capture the subject and interpret it onto the canvas. She will guide students through the process of looking at nature and transposing the image onto paper or canvas in the chosen medium. After the demonstration students are guided on a one to one basis. The workshop is suitable for advanced students and beginners. Bring your favorite painting oil and water based materials or pastels. Basic materials may be purchased from the studio. Class size is limited – early bookings recommended. Ph 9439 3458 or mobile 0417 585 102. Fee includes a light lunch and refreshment.